LONDON, UK – Subex, a leading telecom analytics solution provider, has announced that it has been recognised by Pipeline publishing for innovation in three categories: Big Data & Analytics, Managed Services and Security & Assurance. The Award function was held at Nice, France on May 14, 2018. Subex leverages its award-winning analytics solutions in areas such as Revenue Assurance, Fraud Management, Asset Assurance and Partner Management, and complements them through its newer solutions such as IoT Security. Subex also offers scalable Managed Services and Business Consulting services. BANGALORE, INDIA – Subex, a pioneering entity in the Cybersecurity space, hosted the first edition of its Cybersecurity Symposium with Singapore’s Nanyang Technological University (NTU). The Symposium aimed towards creating a collaborative platform for the industry and academia to discuss ideas and initiatives around cybersecurity education. Representing NTU Singapore was esteemed NTU Academician and cybersecurity practitioner Prof Lam Kwok Yan, who provided his overview of the cybersecurity landscape in Singapore and perspectives on how the lessons learnt can be applied to the Indian ecosystem. Also taking place on the same day was the launch of Subex’s IoT Security Lab, which will solve threats specific to IoT industrial control systems (ICS) and IT Systems. Using the world’s most comprehensive IoT and ICS focused honeypots of over 400 different architectures and over 4000 devices, Subex IoT Lab collects threat intelligence across multiple verticals including Telecom, Academics, Enterprises, Defense and Smart City projects. As part of the lab inauguration, Subex also announced that it will be opening its lab up to public-private partnerships with universities such as NTU and other colleges in Bangalore with a goal to create specific IoT security threat detection and prevention mechanisms for IoT ecosystems. The Cybersecurity symposium also witnessed the formation of a Cyber Security Academic Forum with the objective of establishing an ecosystem in the country for cyber security research to emerge and grow, with the main mission to foster “A Safer Cyberspace”. This forum will provide a unique opportunity to meet and discuss the current issues of cyber disruption and the ever-changing landscape of cyber security and IoT security related threats. Speaking at the Cybersecurity Symposium, Vinod Kumar, CEO and MD, Subex said, “With increasing threats in the Indian and Global cyberspace, we believe that education and awareness around cybersecurity will play an important role towards preparing and securing our critical assets against these threats. However, the topic of cybersecurity is yet to gain prominence within colleges in India, leading to gaps in the available talent pool. We are extremely proud to be partner with NTU Singapore to host the Cybersecurity symposium, and play a part in addressing this gap. The symposium witnessed collaborative discussions and brainstorm sessions between the industry and academia to identify ways to improve cybersecurity education in the country. Having Prof. Lam Kwok Yan provide his expertise on the topic was of tremendous value. Subex is the market leader in the products Security and Fraud Management market, with over 180+ customers in total. Subex is a pioneering entity in the Cybersecurity space involved in multiple public and private partnerships in India. The company runs the world’s most comprehensive IoT and ICS focused honeypots of over 400 architectures in 32 locations around the world. A research-intensive public university, Nanyang Technological University, Singapore (NTU Singapore) has 33,000 undergraduate and postgraduate students in the colleges of Engineering, Business, Science, and Humanities, Arts and Social Sciences, and its Interdisciplinary Graduate School. In 2017 NTU was placed 11th in the world and the best in Asia in the Quacquarelli Symonds (QS) World University Rankings. It was again placed the world’s best young university (under 50 years old) by QS for the fourth consecutive year in 2017. In addition, NTU was named the world’s fastest rising young university by Times Higher Education in 2015. New Delhi, 26rd February 2018: Subex has been announced as the winner in “Data Science” category for their innovation “ROC Insights” at Aegis Graham Bell Award 2017, honoring the best innovation in the ICT domain in India. Subex has been applauded as winner at the 8th edition of Aegis Graham Bell Award (AGBA) at NDMC Convention Center, New Delhi. Subex is a leading telecom analytics solutions provider, enabling a digital future for global telcos. Founded in 1992, Subex has spent over 25 years in enabling 3/4th of the largest 50 CSPs globally achieve competitive advantage. By leveraging data which is gathered across networks, customers, and systems coupled with its domain knowledge and the capabilities of its core solutions, Subex helps CSPs to drive new business models, enhance customer experience and optimise enterprises. Subex leverages its award-winning analytics solutions in areas such as Revenue Assurance, Fraud Management, Asset Assurance and Partner Management, and complements them through its newer solutions such as IoT Security. Subex also offers scalable Managed Services and Business Consulting services. Subex has more than 300 installations across 90+ countries. LONDON, UK – Subex Ltd, a leading telecom analytics solution provider, has announced that it has been awarded the Global Telecoms Business Innovation (GTB) Awards 2017 along with STC in the ‘Enterprise Service Innovation’ category for its Managed Services offering. GTB recognizes the industry’s most innovative & successful project partnerships between the operators and vendors over the last 12 months and showcases the very best projects featuring entries from every corner of industry to reveal the latest innovations, be it application, design, network or product. Subex and STC entered into a strategic partnership program with the objective of building a proactive Fraud Management function through a combination of best practices, domain expertise, tool capabilities and analytics. As part of Managed Services (MS), Subex provided multiple services to STC across areas of Application Support, Business Operations, 24X7 Application Monitoring and Database (DB) & Operating Systems (OS) monitoring – all provided under one roof with KPIs like 99.5% system availability. Faisal A. Alhatlani, Administration Systems Director-STC said “In Subex we have found a partner who can take the next level of fraud management challenges successfully. This move was critical for us with our expanding footprint and exponentially increasing number of subscribers. This MS engagement has empowered us to optimise resources and focus on core-business and strategic initiatives. A highly skilled team from Subex handled FM IT part for continuous improvements”. This is the sixth time Subex has won the prestigious GTB Innovation Awards. 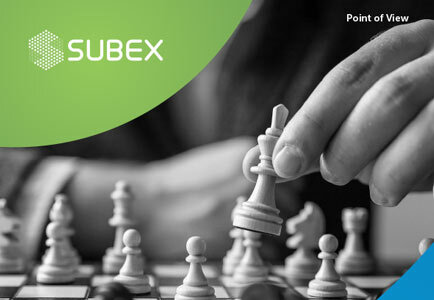 Subex Managed Services offerings are designed to drive new business models, enhance customer experience and optimize CSP enterprises, pillared on four primary aspects of Cost, Quality, Time-to-market and Capability. Our engagements are aimed at providing rapid ROI and increasing efficiency. LONDON, UK – Subex Ltd, a leading global provider of Business Support Systems (BSS) for Communications Service Providers (CSPs), has announced that it has been declared the Winner at the prestigious 2017 Pipeline Innovation Awards in the ‘Innovations in Managed Services’, and the Runner-up in the ‘Innovations in Security & Assurance’ category. The Award function was held at Nice, France on May 15, 2017. The ‘Innovations in Managed Services’ category recognizes innovative technology solutions in the IT managed services domain that enable increased business value and alignment between the IT and business functions. On the other hand, the ‘Innovations in Security & Assurance’ category recognizes innovations that protect service providers operations, revenues, and business from error, fraud, and malicious attack. For the ‘Innovations in Managed Services’ category, Subex successfully showcased how its Managed Services helps CSPs globally to stay on the growth path while driving business outcomes and protecting revenues backed by strong domain, technology, and operational expertise. In terms of the ‘Innovations in Security & Assurance’ category, Subex’s IoT Security and Fraud Management solutions have taken the leap forward in countering security and fraud in new areas such as IoT, Digital and OTT. The Innovation Awards program recognizes prominent industry innovators based on extensive evaluation, objective selection, and validation by the third-party judges of the program which include technical executives from companies such as AT&T, BT, Telenor and Windstream, besides other operators and analysts. London, UK – Subex Ltd, a leading global provider of Business and Operations Support Systems (B/OSS) for Communications Service Providers (CSPs), will be participating in this year’s Mobile World Congress, which will be held in Barcelona, Spain from the 27th February – 2nd March, 2017. Subex will be present in Booth #5F10 in Hall 5. As telecom operators embark on their journey towards digital revolution, it is well known knowledge that they will encounter a broad range of challenges and risks. In order to enable telcos to be successful through this transition, Subex is the trusted technology and business solution provider to help global telcos drive new business models, enhance customer experience, and optimise enterprises. Through its solution portfolio, Subex can empower businesses to drive new business models by pivoting their offerings around revenue, opening new revenue streams in emerging business areas and allied services, and by better leveraging the partner ecosystem. Subex can also empower telcos to optimise their enterprise by helping them bring in operational excellence by focusing on maximizing revenue and mitigating business risks, thus ensuring further Y-o-Y cost savings to make investments for the future. With customers being at the epicenter of digital revolution Subex helps telcos enhance customer experience through the use of advanced analytics, to leverage business insights to better understand customer behaviour for deeper engagement. In line with this, Subex will be showcasing the capabilities of ROC Insights – a unique approach to solving the problem with data growth. The solution’s capability to harness available operational data that service providers have and transform it into actionable intelligence for their perusal – all in near real time, plays an important part in driving new business models and enhancing customer experience for CSPs. Subex will also be demonstrating the capabilities of its IoT security solution. Subex Secure is an IoT security solution which focuses on ensuring cyber resilience, thus providing organisations the ability to identify, protect, monitor, respond and recover from IoT attacks. “With existing revenue streams from Voice, Data and SMS undergoing a fundamental shift, CSPs need to transform their approach to the market and find ways to embrace the world of digital services such as OTT, IoT, Mobile Money, Wearables etc. With 20 years of domain expertise and capabilities, Subex is a strategic partner to service providers in making the leap, to embrace the digital revolution.” said Vinod Kumar, Chief Operating Officer, Subex. In addition to the above, full-fledged mobile applications for ROC Revenue Assurance, ROC Fraud Management, ROC Asset Assurance, ROC Partner Settlement and ROC Insights are being showcased at this year’s MWC event and will be available for hands-on demo. Denver, US – Subex Inc, a leading global provider of Business and Operations Support Systems (B/OSS) for Communications Service Providers (CSPs), will be leading the Dynamic Asset Management in SDN & NFV Transformations catalyst that will be demonstrated at TM Forum Innovation InFocus 2016, in Dallas, Texas. As a catalyst lead, Subex has led the catalyst team in identifying the critical industry challenges, along with several comprehensive solutions, associated with managing dual Legacy and SDN/NFV networks. The catalyst is championed by a major European operator (Orange, France) who is seen as an international leader in SDN/NFV transformations; this operator has acknowledged the seriousness of the challenge, and has worked hand-in-hand with Subex and the catalyst team to validate the detailed data model Subex has created to support a structured dual network operation. The catalyst, a combination of advanced network technology and analytics, has several participants. For its part, Subex has primary responsibility towards Discovery, Analytical Modelling, Forecasting, KPI Visualisations and Data Persistence of Legacy, Software-defined, and Virtual Assets of a hybrid network, using the Subex ROC Asset Assurance platform. The goal of the project is to provide a set of solutions to the hybrid network operations that every operator will be facing in the next decade and beyond. In the coming years, networks that operate both SDN/NFV and legacy gear will face a slew of obstacles in terms of load balancing, capacity planning, Capex planning along with many other challenges. Through the catalyst program Subex, along with Operator Champion Orange France and team participants ESRI and Teltech, aim to demonstrate a comprehensive, repeatable and scalable approach to understand and effectively manage complex facets of hybrid network asset management. Catalysts are proof-of-concept projects developed collaboratively by TM Forum members. These projects bring together companies large and small to create innovative solutions to common challenges demonstrating how this can be achieved leveraging key TM Forum best practices and standards ensuring scalability, reuse and reduced costs and risk. As part of the Dynamic Asset Management in SDN & NFV Transformations Catalyst, Subex and Orange France will be demonstrating how to employ a robust Asset Management program to successfully navigate a complex, multi-year SDN/NFV transformation and highlight business cases where transformation is necessary along with the financial and capacity impacts. “We are honoured to lead the TM Forum Dynamic Asset Management in SDN and NFV catalyst which is focused around the transformation of dynamic networks to SDN/NFV networks. In the ecosystem where the network operates both legacy along with SDN/NFV, operators need to have a clear understanding of their entire network, capacities, and forecasted growth needs in a limited Capex scenario to be able to effectively maintain network quality, sufficient service availability and most importantly, Capex preservation. Through the catalyst program Subex, along with Orange France and our team participants ESRI and Teltech, aim to demonstrate an approach which will help operators understand and effectively manage all facets of their network assets.” said John Brooks, VP – Product Management at Subex. The Dynamic Asset Management in SDN & NFV catalyst projects will be demonstrated at TM Forum Innovation InFocus 2016 in Dallas, Texas, during the 2nd and 3rd of November. Denver, US – Subex Inc., a leading global provider of Business and Operations Support Systems (B/OSS) for Communications Service Providers (CSPs), will be speaking and exhibiting at the 32nd Annual Conference and Trade Exhibition organized by CANTO, which will be held in San Juan, Puerto Rico from the 31st July – 05th of August, 2016. Innovations like Mobility, Cloud Computing, Social Networks and Big Data have changed the way businesses are being run. As operators venture into next-generation services and content-driven service environments, Revenue Assurance becomes more challenging and critical. Adding to operators’ woes is the ever increasing complexity of the network elements that gives rise to newer types of fraud each day. Moreover, Communication Service Providers (CSPs), have to deal with an enormous volume of data. In order to effectively use this data to improve and optimize business processes, CSPs need analytics & insights to derive actionable intelligence out of it. In line with this, Mr. John Brooks – Vice President, Product Management at Subex will be presenting on the topic of “Customer Journey Analytics”, at the event. Subex will also be exhibiting its brand new powerful analytics offering – ROC Insights. Based on Subex’s two decades of B/OSS expertise, telecom domain and telecom analytics experience, ROC Insights is a next generation analytics solution which provides CSPs with a unique approach to solving the problem with data growth. The solution’s capability to harness available operational data that service providers have and transform it into actionable intelligence for their perusal – all in near real time, plays an important part in delivering Business Optimisation to CSPs. Subex will also be demonstrating its Revenue Analytics and Cost Analytics solutions at the event at booth # 40. Subex has been awarded the Global Market Share Leader in Financial Assurance 2012 by Frost & Sullivan and has been the winner of Carriers World Awards 2015 for Best Security/Fraud solution, Telecoms Award 2015 for Advances in B/OSS, Pipeline Innovation Award 2016 for Security & Assurance” and in 2013 for Business Intelligence & Analytics; Capacity Magazine Best Product/ Service Award 2013. Subex has continued to innovate with customers and have been jointly awarded the Global Telecoms Business Innovation Award in 2016 with BTC Botswana; 2015 with Mobily; in 2014 with Telstra Global; in 2012 with Idea Cellular for Managed Services and in 2011 with Swisscom for Fraud Management. London, UK – Subex Ltd, a leading global provider of Business and Operations Support Systems (B/OSS) for Communications Service Providers (CSPs), announced that it has been awarded the Global Telecoms Business Innovation (GTB) Awards 2016 along with BTC Botswana in the ‘Business Service Innovation’ category for Revenue Assurance. The Global Telecoms Business Innovation Awards have been in existence since 2007 and recognizes innovations that contribute to improved business efficiencies in the telecoms world. Subex and BTC Botswana entered into a strategic partnership program with the objective of minimizing leakages across the revenue chain, through ROC Revenue Assurance in a Managed Services engagement, and has resulted in a leakage identification of over USD 3 Million so far. This engagement between BTC and Subex has been a successful demonstration of a highly effective Managed Services model wherein the role of Subex extends beyond simply being a software services provider. This is a classic example of a business partnership between a vendor and operator, wherein both organizations are working towards common goals and objectives by making use of their individual strengths. Vinod Kumar, Chief Operating Officer, Subex, said, “The engagement between Subex and BTC Botswana is a successful demonstration of our highly effective Managed Services model wherein the role of Subex extends beyond simply being a software services provider. This is a classic example of a business partnership between a vendor and operator, wherein both organizations are working towards common goals and objectives by leveraging individual strengths. With tightly knit processes, stringent SLAs, industry best practices, and strong domain expertise. “We are pleased to be declared winners of the GTB Innovation Award along with Subex. The Managed Services engagement with Subex has truly allowed our Revenue Assurance team to expand its footprint by providing analysis and results to various other teams like Roaming, Product Development, Wholesale, Customer Care, Network Operations and Marketing. It has also helped us focus more on strategic objectives, by ensuring that the business tasks are handled effectively by the BTC team supported by the Subex Managed Services team. We at BTC look at this strategic partnership as a long term one, and we look forward to many more achievements together in the space.” said Boitumelo Gabaake – Kauta, Head of Revenue Assurance & Fraud Management at BTC. This is the fifth time Subex has won the prestigious GTB Innovation Awards. With more than 100 global installations, ROC Revenue Assurance is the complete Revenue Assurance solution, designed to tackle critical revenue assurance challenges across the entire revenue chain. It takes revenue assurance to a new level, providing the continuous monitoring and revenue protection needed in today’s changing telecommunications environment. It is highly effective in both the traditional circuit-switched and next-generation, packet-switched service environments; scalable enough to serve operators large and small; and flexible enough to support Revenue Assurance practices as they expand and mature. Subex has been awarded the Global Market Share Leader in Financial Assurance 2012 by Frost & Sullivan and has been the winner of Carriers World Awards 2015 for Best Security/Fraud solution, Telecoms Award 2015 for Advances in B/OSS, Pipeline Innovation Award 2013 in Business Intelligence & Analytics; Capacity Magazine Best Product/ Service 2013. Subex has continued to innovate with customers and have been jointly awarded the Global Telecoms Business Innovation Award in 2016 with BTC Botswana; in 2015 with Mobily; in 2014 with Telstra Global; in 2012 with Idea Cellular for Managed Services and in 2011 with Swisscom for Fraud Management.